Concept mapping is a learning strategy that involves visualizing relations between concepts and ideas using graphical representations. It is a form of graphic organizer that consists of various circles or boxes (called nodes) each of which contain a concept and are all interlinked through linking phrases. The role of these linking phrases is to ‘identify the relationship between adjacent concepts’ (McClellan and Broggy, 2009). As a learning tool, Concept maps were first introduced by Novak and his colleagues in Cornell University in the 70s of last century. Concept maps are based on Asubel’s theory of meaningful learning which states that “learning is meaningful when the student comprehends the relationship of what is being learned to other knowledge”(KILIÇ and ÇAKMAK, 2013, p. 154). In other words, meaningful learning “results when a person consciously and explicitly ties new knowledge to relevant concepts they already possess” (Stoica, Moraru, and Miron, 2010, p. 568). Some key pillars of meaningful learning include prior knowledge, interaction, and collaboration all of which are supported by concept mapping. However, a detailed discussion of the literature and theoretical base of concept maps is beyond the scope of this short post. 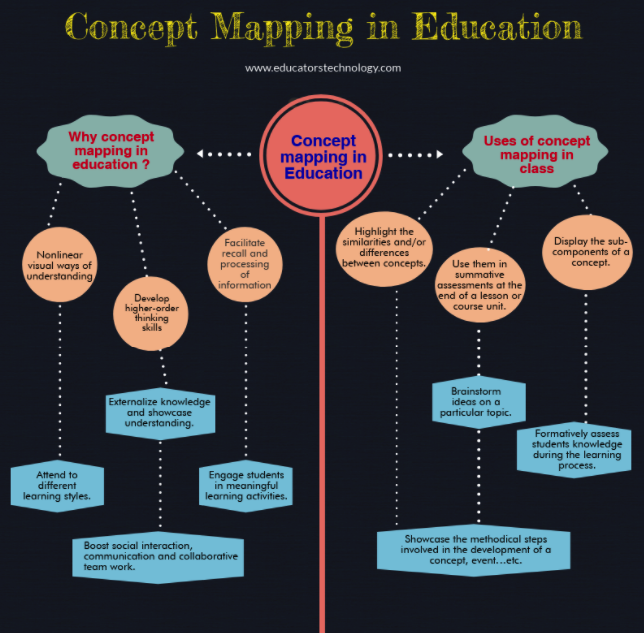 To learn more about concept maps, their underlying theory and their uses in education, we recommend the reference list at the bottom of this post. 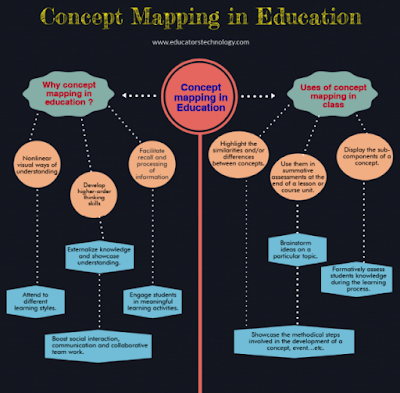 Below is a brief overview of some of the benefits and ways to use concept maps with your students. we have pulled out from reading some of the literature in this regard (please see reference list at the bottom). Highlight the similarities and/or differences between concepts. Display the sub-components of a concept. Showcase the methodical steps involved in the development of a concept, event…etc. Brainstorm ideas on a particular topic. Formatively assess students knowledge during the learning process. Use concept maps in summative assessments at the end of a lesson or course unit. There is an infographic version of this post which you can access from this page. Another good tool students can use to create and share concept maps. It offers various features including: recording notes in different formats with text, images and drawings; link notes to each other; export your final work as PDF or JPEG; supports several languages and many more. Offers tons of pre-designed concept map templates, supports group work, integrated with third party tools including Chrome Store and Google Apps. It also has this handy resource to help you better understand and use concept maps. You can use Lucidchart to design concept maps, flowcharts and different types of diagrams. It also support collaborative features and works across several devices. It also offers this handy resource to help you learn more about concept maps and how to use them in your class. Excellent for creating mind maps, concept maps, outlines and many more. Its 'Presenter' feature lets students turn their maps into slide-by-slide presentations. Maps can embed videos, audio clips, and links. It also lets students search web images directly from the map and add them with a single click. 1- The concept map: a learning tool for any subject (Teaching Commons). 2- The effect of concept mapping on students’ learning achievements and interests (research paper by Chei-Chang Chiou). 3- Concept maps as a tool for meaningful learning and teaching in chemistry education (research paper by Mustafa KILIÇ and Murset ÇAKMAK). 4- Why concepts, why meaningful learning, why collaborative activities and why concept maps? (research paper by Marco Moreira). 5- Concept maps (Reading Rockets). Education Students in an Irish University (research paper by Joanne Broggy and George McClelland).